Surround event: Talkback with artists from the film, Rick & Laura Brown of Handshouse Studios, after the movie. Once in a lifetime experience - talkback after the film with the filmmakers! 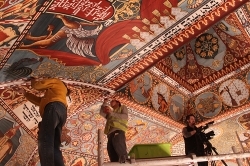 Inspired by images of the magnificent wooden synagogues of 18th century Poland--the last of which were destroyed by the Nazis—artists Rick & Laura Brown of Handshouse Studio set out to reconstruct a replica of the stunning, mural-covered Gwozdziec synagogue. Working with a team of 300 artisans and students from around the world, using only period hand tools and techniques, the Browns finally realized their dream. In 2014, the show-stopping reconstruction of the Gwozdziec synagogue roof was unveiled as the centerpiece of the new POLIN Museum of the History of Polish Jews, in Warsaw. 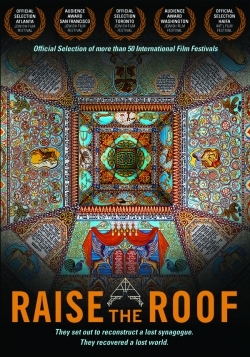 Filmmakers Yari and Cary Wolinsky's beautifully photographed and rendered film Raise the Roof, tells the story of this remarkable 10 year project against the backdrop of the 1000 year history of Jews in Poland. Copyright Trillium Studios. Courtesy of The National Center for Jewish Film.